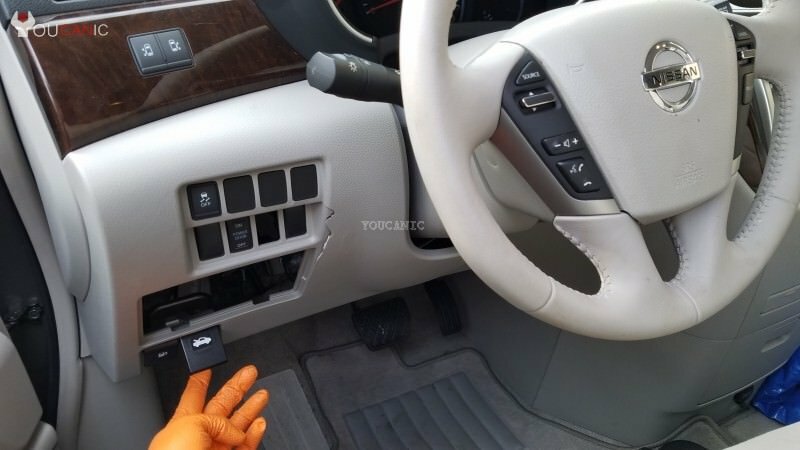 Learn how to jump-start 20011-2017 Nissan Quest. To jump-start your Quest you will need either a jump box. These instructions apply to Quest made during these years: 2011 2012 2013 2014 2015 2016 2017. Always make sure that keys are removed from the ignition when you connect the cables. Remove key from the ignition. Modern cars are very sensitive to voltage and Nissan Quest is no exception. To avoid electrical problems, start by removing the key from the ignition or turning off the car via the Start/Stop button. Open the hood. Locate the hood release underneath the dash. Pull the lever until you hear the hood pop open. Next, you need to release the hood safety latch at the front of the hood. Locate the terminals where you can jump start your Nissan Quest. The battery is located on the driver's side as shown in the picture below. Attach the red (positive) cable to the positive terminal. If you are using another car to jump start your Nissan Quest, next you will need to connect the positive terminal to the helper car. Connect the black (negative) cable to bare metal if that is possible. If not use the negative battery post. If you are using a jump box you are now ready to start your Nissan. If you are using jumper cables to connect to a car with a good battery, connect the jumper cables to the helper car.